Calzones are simply little pizzas made into turnovers with all the fixings that make a pizza on the inside. 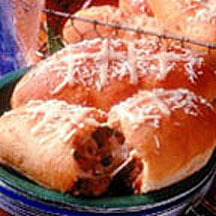 These hand-held calzone "footballs", topped with cheese "laces", will score big with armchair quarterbacks. For filling, remove sausage from casing. Sauté sausage in large skillet, breaking up with fork, until sausage is cooked and browned, 5 to 8 minutes. Drain well and set aside. Preheat oven to 375°F (190°C). Make hot roll mix according to package directions for pizza, replacing egg and butter with hot water and olive oil. Let dough stand 5 minutes. Divide dough into 8 pieces. Roll each piece into an oval about 5 x 7-inches. Place 1/4 cup of Italian cheese blend in center of each oval. Top with 1/3 cup cooked sausage. Spoon 1 tablespoon pizza sauce over sausage. Sprinkle with another 1/4 cup cheese. Bring up edges of dough and seal securely. Transfer calzone to lightly greased baking sheet, placing seam side up to form a "football" shape. Repeat with remaining dough and filling. Set calzones in a warm place to rise, covered with towel, 25 minutes. Bake until lightly browned, about 20 minutes. In a small skillet, heat butter and garlic over low heat until butter is melted and garlic is tender, about 3 minutes. Remove calzones from oven when lightly browned. Brush hot calzones with garlic butter and sprinkle each with 1/2 tablespoon Parmesan cheese. * Return to oven until cheese melts, about 2 minutes. Let stand 5 minutes before serving. *To make "football laces" on calzones, cut thinly sliced mozzarella into thin strips. Arrange on calzones after brushing on garlic butter and sprinkling with Parmesan cheese. Calzones can be baked and refrigerated up to 2 days in advance. Reheat at 350°F (175°C) until hot, about 20 minutes. Recipe and photograph provided courtesy of the American Dairy Association.